AS IT STANDS: 21st Century Christmas Icon: Zombie Claus! Have you been good little boys and girls this year? You better have, because otherwise you're going to get a visit from Zombie Claus! 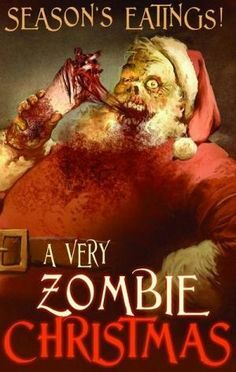 Yes, Zombie Claus. You know why? Because zombies are so damn popular in our society today. Like these video games: Star Wars Zombies, Santa's Zombie Elves, and Zombie Christmas Story to give a few quick examples. Does Santa Claus Visit Zombie-Kids? If you're interested in getting into the spirit of things here's a video on how to turn yourself into Zombie Claus. Be the life center of the party when you arrive to give out scary gifts to bad little boys and girls! If you're a Christmas traditionalist, don't let this post bother you. I'm not advocating anything. Simply observing how popular zombies are in our culture now.